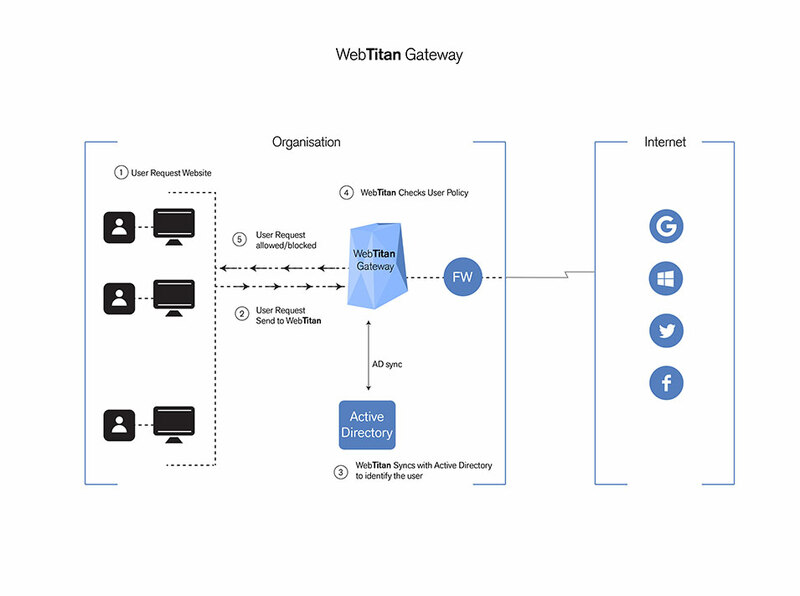 WebTitan Gateway is a web security and content filtering solution that offers best of breed malware protection, highly granular browsing policy controls and comprehensive reporting while seemlessly integrating into your existing network. It is delivered as a software appliance, run on your own hardware or in your virtual infrastructure. Higly scalable, functionally rich and easy to deploy and manage, it is designed to provide the best possible protection for your organisation when on line. Can be set up in full proxy or transparent proxy mode. WebTitan Gateway fits easily and seemlessly into your existing network. It is functionally rich, offering multiple integration options, granular policy controls and comprehensive malware protection. All designed to be easy to use and simple to manage. 4 Predefined Report Groups – Behaviour, Security, Trend and Bandwidth. WebTitan Gateway includes a full reporting suite. It gives a live view of your users browsing activity, fully searachable by multiple filters including time, user and catagory. It also offers predefined reporting options including behaviour, security, bandwidth and trend reports, all fully customisable through multiple filter options. All reports can be automated and scheduled and delivered by mail, pdf and excel.